Sometimes the best way to sneak in a little learning is in unlikely places. How about teaching some math at the park or in your own backyard? 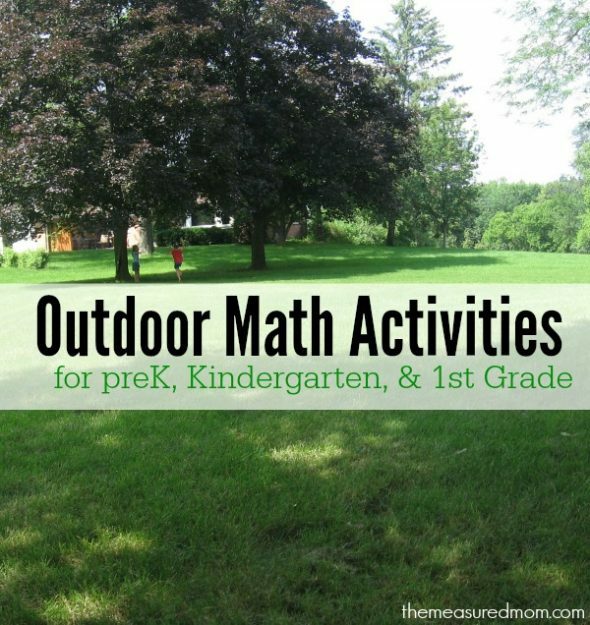 Here are some outdoor math ideas for kids. After a long cold winter, it finally feels like summer! 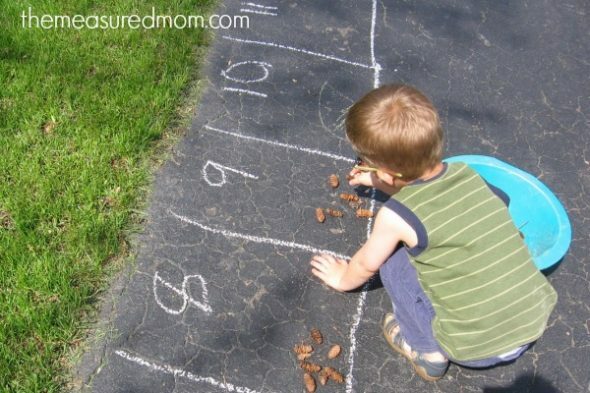 My kids have been spending a lot of time outside, so I’ve put together this list of ways that we’ve done some math in the great outdoors. Under our pine trees we have thousands of tiny little pine cones. So following an idea from Peaceful Parenting, I drew boxes with the numbers 1-20 on the driveway. Then my just-turned Four worked at filling up the numbers through 10 and my Five counted pine cones for the larger numbers. Despite my nervousness around little boys and very long sticks, my Four and Five love to collect the big sticks they find in our yard and the little wooded area in the back. They rang the doorbell to show me all the sticks they had collected… and sorted by size. 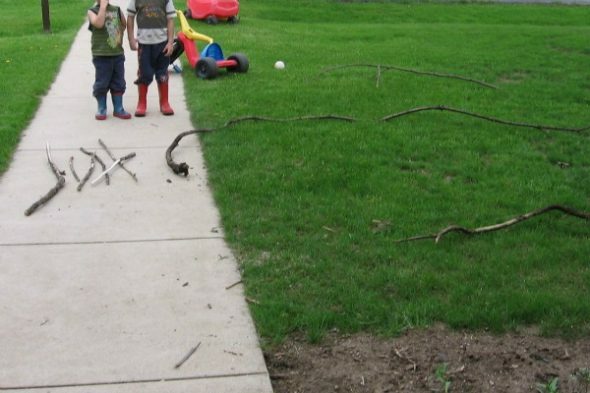 You could also have your child put the sticks in order from shortest to longest. 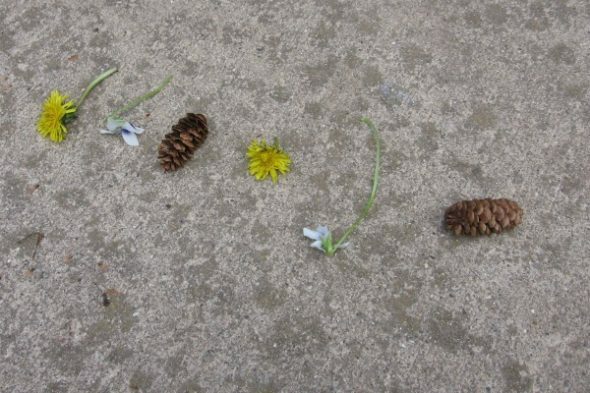 You could do the same thing with leaves or wildflowers. 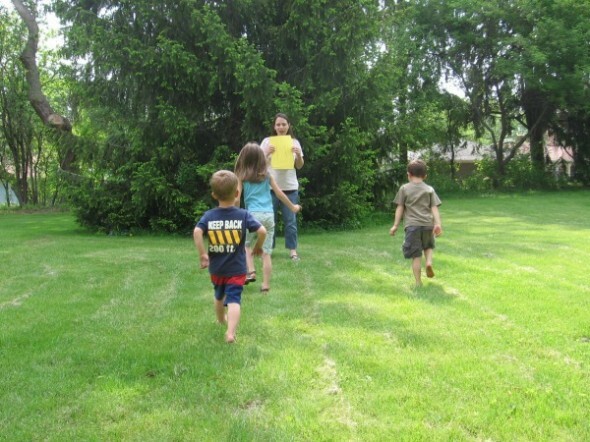 Last spring, I printed this set of action cards and had my kids (ages 2,4, and 5 at the time) hunt for objects in the yard. They loved this very active scavenger hunt, and it was great for teaching my almost-three-year-old about size. I think we’ll have to pull it out again this year! Learn more and get your free printable action cards in this post. This game can be modified in so many different ways. 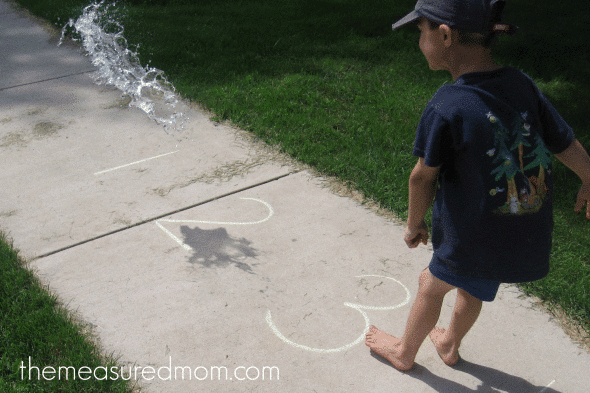 Prepare some water balloons and write either a single number or an addition or subtraction fact on each one. 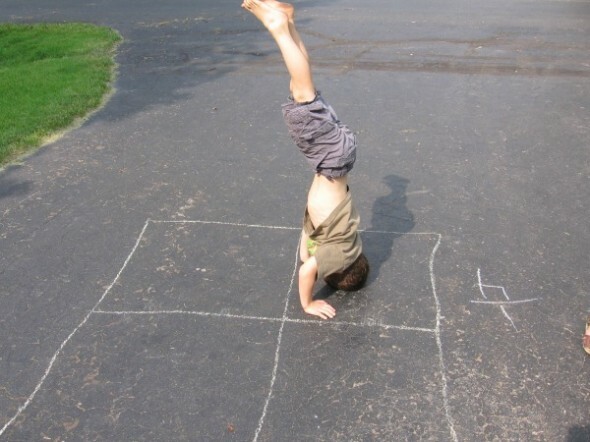 Then write matching numbers (or answers to the addition and subtraction problems) on your driveway or sidewalk. As your child chooses a balloon he throws it on the matching number or answer. My kids loved learning and staying cool at the same time! Fractions can be a difficult concept, but this short lesson seemed to do the trick for my Five. 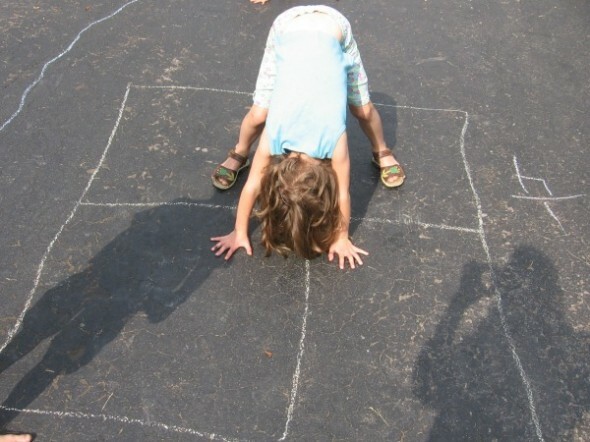 I drew a large rectangle on the driveway. We talked about how this was one whole rectangle. Then I divided it in two equal parts (okay, they weren’t exactly equal, but the kids didn’t notice). I had my Five stand in one part to show “one half.” Then his sister stood in the other half to show “one half.” We talked about how two halves make a whole. This game was designed for my just-turned-Four, but it wouldn’t have been fun without his older siblings playing along. I had written the numbers 1-12 on pieces of construction paper. I was the Wolf and stood at the end of the yard. The kids stood facing me at the other end of the yard. They called, “Mr. Wolf, what time is it?” Then I showed a number, and they took turns reading it. When I showed the “2,” for example, one of them would say “2:00!” Then they walked toward me that number of steps. Periodically I would put down the pages and call out “Lunch time!” At that point the kids would try to reach the tree behind me or run back to start, where they were “safe.” I ran after them to try to catch them. If they reached the tree behind me safely, they could be the next Wolf. Hint: wear shoes you can run in. This is excellent exercise for the mom. These look fun! I will definitely try these with my kids! You have the best ideas! Thanks for sharing already used a bunch for my 3 and 1.5 kids, and I look forward to incorporating them into my classroom next year! Thank you so much, Carmen! I hope your students enjoy them. I love these math activites! Good for both my 8 year old and 4 year old! I’m working on an article for Scholastic Teacher magazine. In each issue, Teacher compiles lesson ideas on specific topics to share with teachers. (Readers total about 100,000 K-8 teachers in print and many more online.) 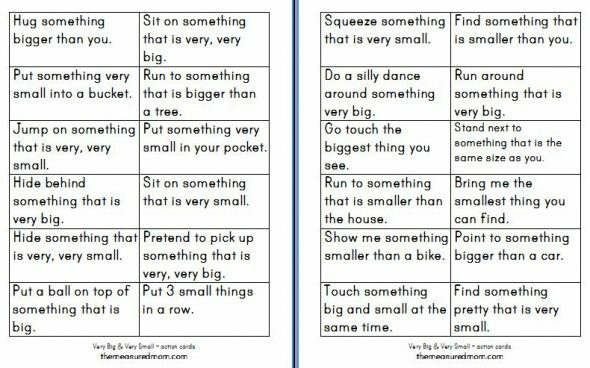 You can see an example of these lesson ideas here. 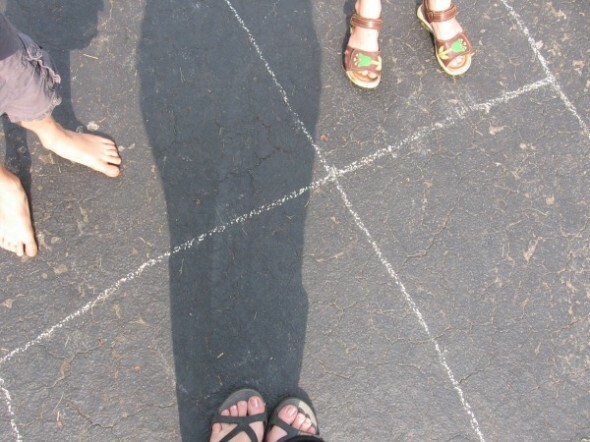 I’m currently working on ideas for outdoor math activities for grades K-1. I came across your outdoor activities and would love to include one or two. They are so creative! I’m reaching out to ask your permission for me to summarize the lesson and quote from your blog post. I’m on a tight deadline and, as such, would appreciate your response by Friday, March 10. Thank you for reaching out! While I would love to be included, I do not have high quality photos of any of these activities. We are still having winter weather, so I wouldn’t be able to take new pictures for you. Thank you anyway! Thank you so much for accepting me in your blog. Your activities really help me to improve my teaching in different areas. Your site is amazing! 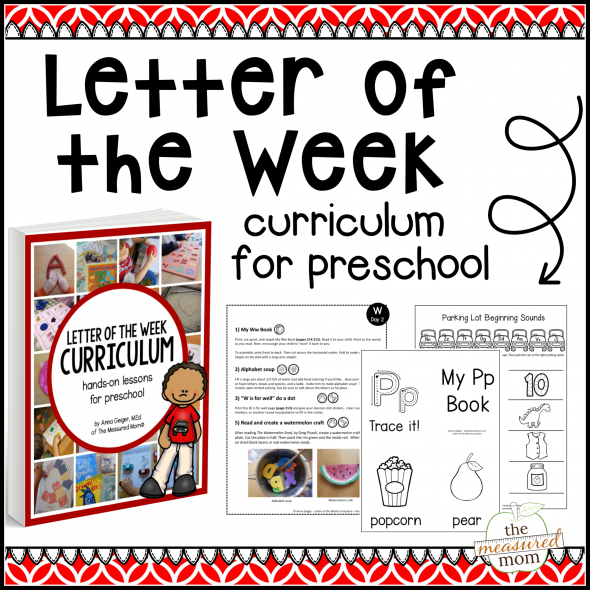 Thanks so much for all the great resources! These are really neat! I like the stick sizes and the counting objects in groups! thanks so much! Thank you for sharing all your great ideas. My first graders love these engaging activities. This is the first sight I visit when looking for new ideas to teach. Thanks again.